I love making quilts that are not always bed-sized, but are more unusual sizes and shapes. Bed runners, smaller children’s quilts and wall hangings are quick and easy projects for all of us. But, how to best showcase those smaller quilts is always an issue; if they don’t fit on a bed per se, how best to surround yourself with them in everyday life? I made this quilt a long time ago – it was featured in Quilter’s Connection magazine; I called it Savasana…after the final resting pose in yoga. 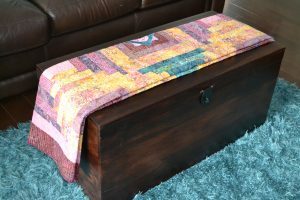 I particularly love the teals and purples of the batiks in this little quilt and thought, perhaps I could use this quilt in our family room. I think it works pretty well on top of our blanket box folded. 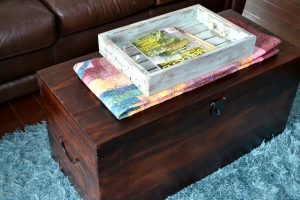 The wooden crate on top holds magazines for easy reading. Another way the quilt can work is unfolded. The embroidered images are surrounded by Brother teal metallic embroidery thread; the perfect complement to the small area rug in our family room. 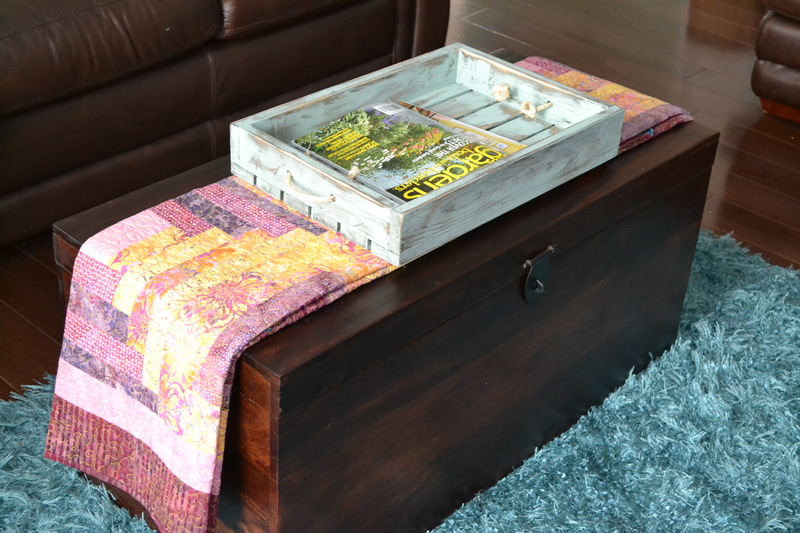 How can you best utilize your quilts in your home decor? Good day everyone! I want to share with you a free, pattern download that I have added to my website. 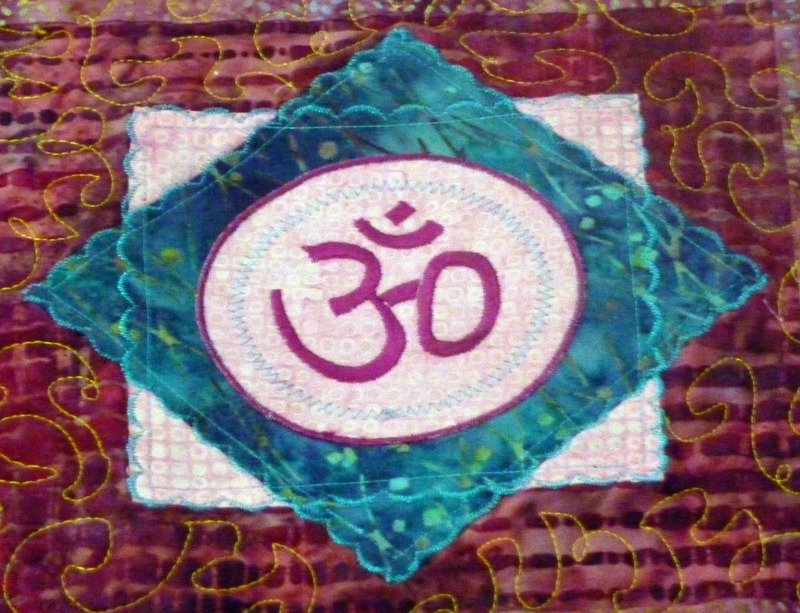 It’s an easy-to-create, batik, savasana quilt with embroidery embellishment. I also offer the embroidery design free, as a download. (The embroidery design is in the .pes format). I was so thrilled to have this quilt featured in the Canadian magazine, Quilter’s Connection – Winter 2011 edition. You can choose to make the quilt with a featured batik fabric and surround it with complementary batik fabrics, or you can use batik scraps to make an entirely unique project. Access the pattern at www.KimHansonQuilts.com/shop and scroll to the bottom of the page to download. Happy quilting! Like many of you, I have a few passions; one of them is my yoga practise. I have met so many great people in my yoga classes – some of them instructors some of them students. Yoga has become an almost daily occupation for me – I don’t practise every day, but several days per week for sure. Practising yoga has basically changed my life – for the better in every way. My anxiety level has dropped significantly, my body is in better shape than probably at any other time in my life and I now seek quiet where before it was chaos that I sought to find. Another long standing passion I have is quilting. One day when I put the two of them together, I came up with, what I like to call – the Patchwork Yoga Mat Bag. Embroidered yoga symbols on the bag work to embellish it and make it special. I adore symbols that depict AUM – there are so many, but I have a special few that I really like to use. Also, the lotus can be digitized in spectacular fashion and embroidered in as many colors as you can imagine. Each bag that I make is different from the last. The Patchwork Yoga Mat Bag is indeed made in a patchwork style, holds your small or large yoga mat, your keys/water bottle and a towel or change of clothes. This is my latest bag, sent to a sweet and lovely customer/friend in Vermont ….hope her daughter likes it! Delicious colors combinations, charming and whimsical embroidery designs and such fun and easy, breezy patterns bring the Quilt Creator (You!) so much personal satisfaction and the Q.R. (quilt recipient) so much delight. Any of my patterns can be customized by the Q.C. for the Q.R. with ease and a little pre-planning. Take My Flower Garden for example. Crazy quilting with an embroidered twist! Step #1: Decide who the Q.R. will be and what theme your quilt will portray. Step #2: (Fun part……) Sit down with your fabric stash and choose fabric colors that will suit your theme and your Q.R. Better yet, jump online or head to your favorite quilt shop and purchase some brand new fabrics. Step #3: Head on over to a great embroidery website that features downloadable designs and shop to your generous heart’s delight. (I totally love www.embroidables.com and have used many of their designs in my work.) Step #4: Begin your creative process and love, love, love what you do! It will show in every stitch that you make. Your embroidered quilt will shine and your Q.R. will love your work and cherish the project. So much fun! Combining two things that you love can lead to unexpected outcomes. The joy of creation is one of life’s greatest pleasures. 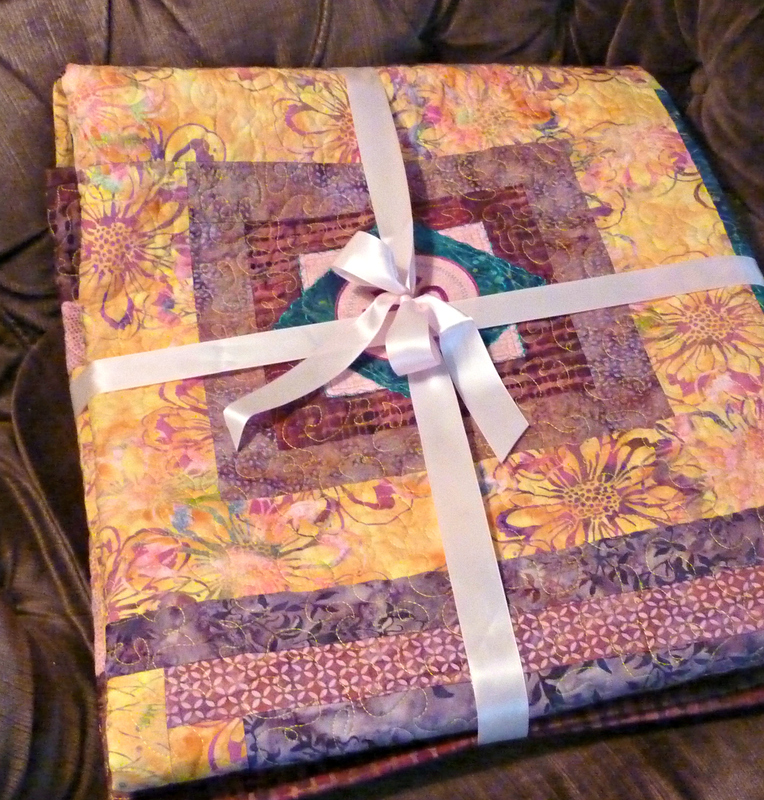 Loved the pics of all your quilts, pillow and yoga mat. Guess my project was the quilt I made for my husband. Hand embroidered bass fish blocks set together with fishing stuff material, then I freestanding embroidered fishing lures to add to the fishes mouth to make it look like he had caught the fish. Plus doing quilts for my 4 grandchildren is a favorite pass time. Love all the quilts. I enjoy using my embroidery unit to do the actual quilting designs on quilts. I also like to use machine embroideries to do crazy quilts. your quilts are wonderful. i might have to try making a yoga mat. Love your “4 Steps”–very inspiring. Kim, Love all your quilts. I’m just learning to do Machine Embroidery and you have definitely encouraged me. Being a quilter I want to be able to combine both the embroidery and the quilting. Wish me luck.Thanks a bunch. Love the 3D effects and the great embroideries, Kim. Kim, Congrats on being picked as a guest blogger. I used my embroidery machine daily when I first purchased it but seems lately the new has worn off. Thanks for new inspiration. Love what you do with embroidery in your quit making, truly inspirational! Hi Kim… Just love your quilts I work in a Fabric Shop and we have quilters classes on Weds… would love to introduce Embroidery designs on their quilts and these are perfect examples to show for great inspiration! I also love the embroidery designs… Wink wink! Redoing my sewing room to make room for more quilting stuff… love your projects! Love your quilts, great colors to brighten up any room! Just started in quilting and have enjoyed making the 4 I have made and am always looking for more ideas to add to my list of quilts I want to make. I have made 2 kids quilts for “Quilts 4 Kids” and your “Baby Boy Bliss” would be a good one to do for that group. Colorful and not too complicated for a beginner like me. Your quilts are just awesome Kim. When I saw this earlier today it didn’t click in my head until I remembered where I’d seen that quilt before. You and I both know how great Jami’s embroidery designs are and how mixing the machine embroidery designs with quilting works so well. Getting quality designs is the secret to making it so professional as well and the Embroidables designs are always just perfect. I’m glad that I got to see even more of your quilts here. I know that very top one is one of may favorites because of the colors you used. Top quilt is my fav. Great inspiration Kim. Thanks for sharing. I love Jacob’s Crazy Pillow. Thanks for sharing. Oh I love your pillow with the crazy quilting and embroidered words/trucks! And kids would love the texture of your Baby Boy Bliss quilt. I’m wanting to try putting chenille shapes on a baby quilt as alternate blocks to a 4 or 9-patch block; just haven’t gotten around to it yet! You’ve given me inspiration. Nice quilts Kim. Nice website, too. 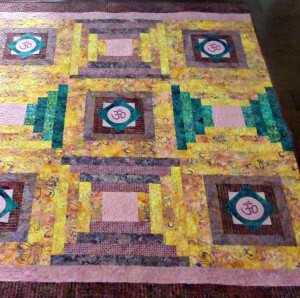 Just love the top quilt, I am new to this, have made or helped make several (too many to remember) rag quilts and just finished my first pieced quilt. I machine stitch my blocks and a very very talented and dear friend has a long-arm quilt machine and she custom quilted it for me. Absolutely beautiful. I am so blessed to have Christian friends whom love to share the love of our Saviour and quilting knowledge. We have so much fun getting together. Your quilts are amazing! The colors that you select blend so well together and the embroidables designs accent your quilts beautifully! I especially love the crazy pillow that you made for Jacob! That is one quilt size that I can probably complete! You inspire so many people with every quilt you create! Thanks for the inspiration! I love these quilts! I hope to quilt when I retire. These beautiful quilts make you want to start sewing. Thank you all so very much for taking the time to comment on this blog. Your words are so kind and very inspirational to me. Thanks so very much. The winner of the 160+ Rotary Block Cutter quilt gadget is fun2sew…. I love this. I’ve made several embroidered wall hangings, as opposed to quilts, using my embroidery machine. I’ve made 12 Days of Christmas, a traditional Christmas theme, Valentine’s Day, St. Patrick’s Day, Baby themed, I made a wedding pillow for the son of a friend of mine. I wish I could post pictures. But if you go to my website, they may be up. (My son-in-law and daughter have been working to get them up). I love your “twist” on some of the ones you’ve done, especially the one with the “raw edges” showing. Never thought of doing one that way. I’m retired and have more time to devote to sewing and embroidering …. two of the things I love do to more than any other crafting venue I do (I’ve sewn since I was 5 years old … by hand … and I’m almost 64, I learned on a Singer treadle and my Mom’s White sewing machine, both of which are older than me). Keep up the good work. I’ll be checking back often to see what’s happening.